SARANAC LAKE — Independent gubernatorial candidate Stephanie Miner discussed job growth, ethics reform and running an independent campaign in an interview at the Enterprise office Thursday. Miner said both major parties are complicit in state and federal corruption, and she cannot sit silently just because the people doing it are members of her political party. As an independent candidate under the new Serve America Movement banner, she said she does not have as much of the built-in party infrastructure supporting her campaign, but it allows her more freedom to have her ideas not judged through a partisan lens. One of the main issues Miner says it allows her to hit with more potency is ethics reform. She believes there is systematic corruption in Albany that she can change by reforming the ethics watchdog mechanism, reforming the election process, and keeping comprehensive and public records of state agencies and the money they spend. Miner said she would eliminate the state Joint Commission on Public Ethics and replace it with an independent watchdog body using the model proposed by former Cuomo counsel Evan Davis. The body would be modeled after the state Commission on Judicial Conduct, which monitors judges, and would have the power to subpoena and discipline ethical violators. Miner believes that to get New Yorkers more involved in the democratic process they must have access to easier voting, including early voting, voting by mail and non-partisan districting. She also said she could attack big money’s influence by stopping anonymous campaign contributions under cover of LLC corporations. She has stopped accepting any LLC contributions herself. Pushing for more accountable state public sector agencies using data was a priority Miner referenced several times. “Every agency, every level of government would have benchmarks and data that would be open and public and which would measure that agency’s outcome,” Miner said. The state could look at the agency’s goals and results before budgets and see if it is getting a good return on investment. Miner is big into using public data as a watchdog and decision-maker. She wants state money to be accounted for and for more specific control of where it goes. One example of this is what she would want to do with possible money won from several New York opioid lawsuits. Miner said that if these court cases result in payouts from the pharmaceutical companies, the money should go toward solving the opioid problem and not into the general fund. Though running an independent campaign means taking a hard road, Miner feels it is the right one because she is serious about solving problems. Not being tied to the party she has represented in the past, she said she can speak more credibly about the failure of the Democratic economic development programs and bureaucracy. She cited studies from the Federal Reserve, Liberty Street Partners and Upjohn Institute. Miner said Regional Economic Development Council and Downtown Revitalization Initiative grants, like the $10 million one Saranac Lake recently was awarded, are not transformative. “I think that those programs are cotton candy that is delivered in election years,” she said. “I think we should eliminate those programs, we should put that money toward infrastructure. She said infrastructure is a better way to build the economy, and by infrastructure she means broadband as well as bridges. She said she hopes to bring people and businesses to New York by making the property taxes competitive with other states. “Instead of having all these incentives, why not fix the underlying system?” Miner said. She also wants to have the state pay the share of Medicaid it has always given to the counties and use the extra money as a rebate to property taxpayers. 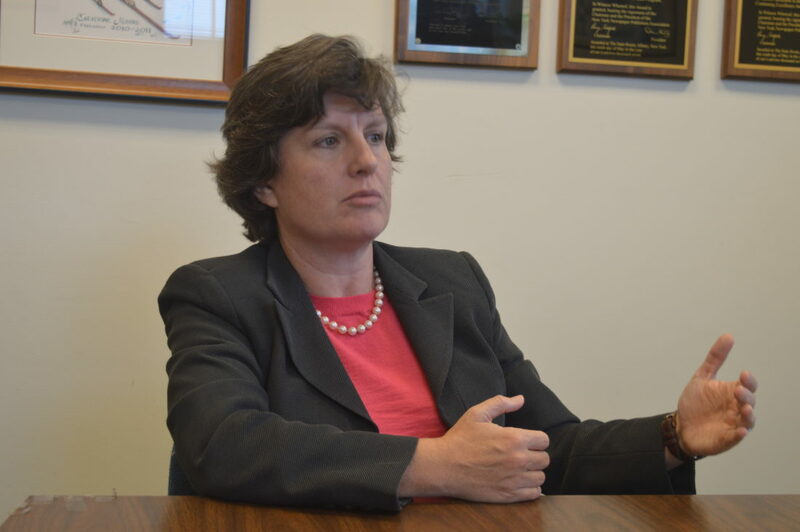 The state splitting its portion of the Medicaid bill is another example of an unfunded mandate putting financial stress on New York counties, she said. “What I have seen over and over again is Albany just say, ‘This is a great idea,’ pass it, take credit for it, and then the localities have to figure out how to pay for it,” Miner said. Ending unfunded mandates means having to say “no” to some things, she believes. Miner said laws and rules should not be passed before they get proper response from the public and counties that they will affect. For example, though she favors gun control, she said the SAFE Act is problematic because it was passed overnight. “We went to bed on Monday night and woke up on Tuesday morning, and there was the SAFE Act,” Miner said. Miner wants public comment on state legislation even after it has been passed, saying it is a good way to make sure good ideas are used correctly. She liked a story from London where the government offered to install attic insulation for free in order to make houses more energy efficient. After a year, the program had barely been used. The government brought in a group of behavioral psychologists to determine why and found out: No one wanted to clean their attic. The program was re-released with free installation and cleaning, and became much more widely utilized. Miner said this would not be a “Big Brother” type of behavior incentivizing but something to make the government more attentive to its constituents. On Tuesday, Miner had signatures from almost 41,000 supporters, nearly tripling the number the state requires to get on the ballot.